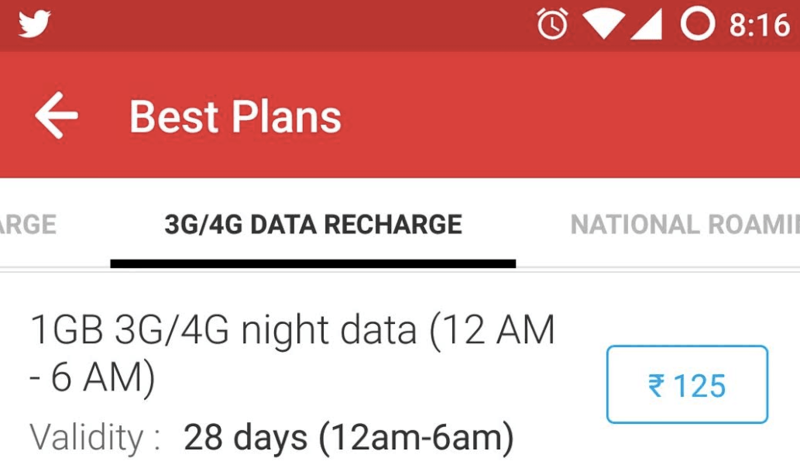 Airtel has launched a new “3G/4G night data” pack at Rs. 125 for the customers. The new offering will provide 1GB of data for 28 days between 12am to 6am. Airtel has launched this new offer after the company has announced ‘Get 100% extra data for Nights’ scheme, which offers various data packs between 500MB to 20GB. Vodafone too is offering a similar pack. However, its 1GB night pack costs around Rs. 75 for a single night. Idea Cellular too offers the 1GB night pack around similar cost for some of their 3G circles. Considering the 28 days of validity the subscribers get at Rs. 125 for 1GB night data pack from Airtel, this seems to be beneficial for the users. Ahead of Jio’s commercial launch, Airtel seems to be pouring out data benefits to customers. The company is focused on offerings “Added services’ and “Extras” to the subscribers. In the upcoming days, more revamp of data offerings can be expected from the company. Airtel’s data ARPU has also grown higher than its rivals in last quarter, basically driven by their 4G/3G network expansion and campaigns. I am getting 50% cashback since March end.. can any one help me how to 100% data back on Airtel..